We want to wish everyone a safe and happy Labor Day weekend! We invite you to come out and watch the Mini Highlandettes this Friday, August 31st for a special halftime performance at Bulldog Stadium. The Bulldogs will take on Wimberley in the first home game of the season. Kick off is at 7:30! Casey Burkhart, Principal of Burnet High School, has been selected to represent the Texas Association of Secondary School Principals as the Region 13 Outstanding High School Principal of the Year. 2018-2019 BHS Professional Development Kick-Off!! Monday, 16 members of the Burnet High School Band competed at the UIL State Solo and Ensemble contest at Hendrickson High School in Pflugerville. We were extremely proud of how each group performed and most importantly, how they represented Burnet with Spirit, Pride, and Honor. 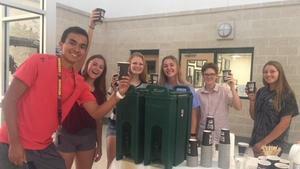 Don't Miss the Back to School Bonanza, Saturday, August 18th!! 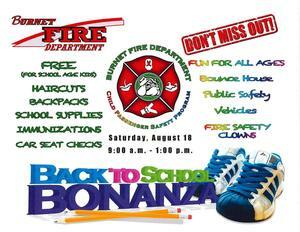 The Burnet Fire Department is sponsoring a FREE event offering haircuts, school supplies, backpacks, and much more. Ian Carter - 110 Hurdles State Champion! Congratulations Ian, what an impressive win! Art Piece Headed to Washington D.C.
Every year Congressman Roger Williams picks an art piece from his #25 District. This is a large district with a lot of big school in it. This Year Jazmine Castillo's art piece won and it will be hung in Washington D.C. for a year. She also has won a plane ticket to go to Washington to see it hung in June. Burnet FFA Range Judging Team is 4th in the NATION! The Burnet FFA Range Judging Team competed at the National Contest held in Oklahoma City, Oklahoma. The team earned their ticket to nationals by placing 4th at the State contest! After scores were tallied, the team placed 4th in the Nation! Individually Marc Barnett placed 4th in the Nation as well! Other team members include Ellett Vann, Katelyn Moore, and Lyndsi Woods! We are super proud of this first year team for all their hard work and dedication! STATE CHAMPS - Burnet FFA Forage Team!!! The Burnet FFA Forage Team competed at the State contest today held at Sam Houston State University in Huntsville, Texas. At the end of results, our boys were crowned STATE CHAMPIONS!!! For a few of these boys, this makes the second state championship they’ve won this week! They have made this FFA deal look easy, but I assure you there is nothing easy about what they are accomplishing. Many many hours, late nights and early mornings have paid off for them! There were 57 teams competing today, representing schools from all over the State. Marc Barnett was Champion High Individual out of over 200 contestants! Ellett Vann placed 5th as an individual and Clayton Atkison placed 6th! Other members include Greyson Barnett and Kaden Sanders! A special thank you to Mr. Vann and Mr. Barnett for all of their assistance co-coaching this team! It truly was a team effort all the way!